Facebook HackerCup 2011 – How To Participate? Facebook Hacker Cup 2011 is Facebook's first ever annual and international programming contest where hackers and programmers will compete against each other for fame, fortune, glory and a shot at the coveted Hacker Cup. The contest comprises three online rounds which you can take part in right from your home. The fourth and the final round will be held at Facebook's headquarters in Palo Alto. Who Should Take Part in Facebook HackerCup 2011? Any one who is older than 18 years and is not a relative of any Facebook employee can take part in the HackerCup 2011. Computer Science students who would want to work at Facebook in the future should take the HackerCup as a good platform for to get themselves to get noticed by the Facebook developers team. 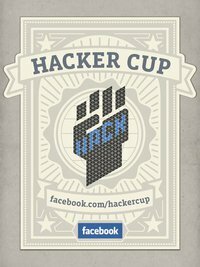 How to Apply / Participate in Facebook HackerCup 2011? You can register online for the Facebook HackerCup 2011 on: facebook.com/hackercup/reg.php. You have to fill in your details and submit the form to get yourself registered for the contest. What Is The Schedule Of Facebook HackerCup 2011? The qualification round for Facebook Hackercup begins on January 7 and goes upto January 10. Online Round 1 begins on January 15 and runs up to January 16. Online Round 2 begins on January 22 and ends on the same day. The final round is on March 11, 2011 at Palo Alto in California. What Is The Takeaway Prize at Facebook HackerCup 2011? The winner of HackerCup gets a cash prize of $5,000 and the HackerCup Trophy. The runner-up gets $2,000 and the consolation prizes are of $1000 for the 3rd place holder and $100 each for 4th to 25th positions. Also the top 300 contestants in Online Round 2 will get a Hacker Cup t-shirt. You can find more finer details about HackerCup 2011 here.